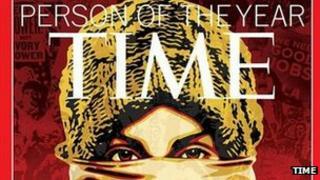 Time Magazine's choice for the person who made the single greatest impact in 2011 is The Protester. The pick reflects the importance of demonstrations during 2011 - from the Arab Spring to Occupy Wall Street and the recent Russian rallies. The weekly news magazine said the award recognised protesters for "redefining people power" around the world. Runner-up was Admiral William McRaven, commander of the US raid that killed Osama Bin Laden. He was followed by Chinese dissident artist Ai Weiwei, whose secret detention this year by Beijing authorities sparked an international outcry. Next was US Republican congressman Paul Ryan, architect of a conservative budget plan that sparked an ideological firestorm in the spring. Britain's Duchess of Cambridge Kate Middleton, who married Prince William in April, rounded off the short-list. Time editor Rick Stengel noted that protesters had been the force behind the largest news stories of the year. "They dissented, they demanded, they did not despair, even when the answers came back in a cloud of tear gas or a hail of bullets," Stengel said. "They literally embodied the idea that individual action can bring collective, colossal change." Last year, Facebook founder Mark Zuckerberg was Time's Person of the Year. Other winners in recent years have included US Federal Reserve Chairman Ben Bernanke, President Barack Obama, U2 frontman Bono, President George W Bush and Amazon.com founder Jeff Bezos. In 2006, Time chose "You" as the Person of the Year to reflect the growing power of social media.